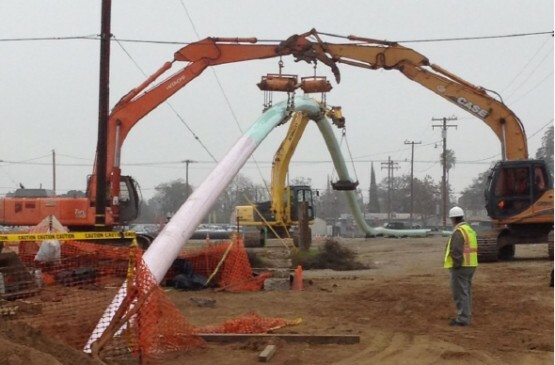 Bennett Trenchless Engineers served as the trenchless subconsultant to O’Dell Engineering on the replacement of the City of Modesto’s 18-inch inverted siphon under the Tuolumne River. The existing siphon was replaced with two new 650-foot, 18-inch fusible PVC pipelines installed by horizontal directional drilling. Bennett Trenchless Engineers provided preliminary and final design services for the trenchless crossing, including hydrofracture and settlement analyses, pipe stress and pullback calculations, technical specifications, trenchless design drawings, and part-time on-site inspection services. The geotechnical conditions consisted of loose clean to silty sands near the surface, grading to medium dense near the bottom of the bore. High groundwater levels combine with the loose sands near the surface posed a high risk of bore collapse and subsequent settlement of the ground surface and overlying utilities. Conductor casings were specified at the entry points to maintain bore stability and protect the overlying utilities from damage due to settlement or hydrofracture. The bore alignment was designed to minimize risk of hydrofracture into the waterway. Challenges on this project included sequencing construction to maintain operation of the existing siphon, protecting two existing 60-inch gravity sewers located near the entry point, minimizing impacts to the Dryden Municipal Golf Course on the west side of the crossing, and avoiding conflicts with numerous utilities on the east side of the crossing, near the abandoned Modesto Tallow Company rendering plant. © 2015 Bennett Trenchless Engineers. All rights reserved.